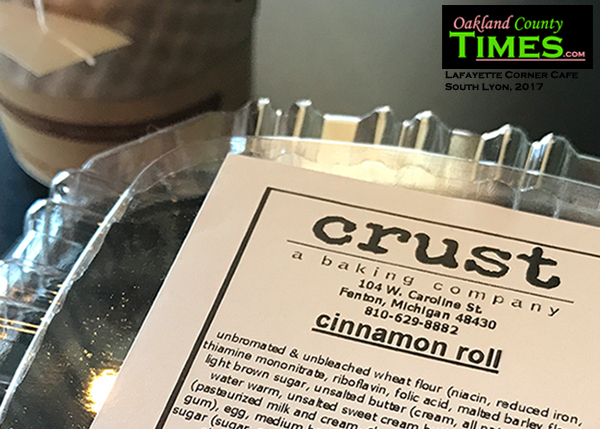 South Lyon, MI – Though the Oakland County Times tends to focus along the Woodward Corridor (and Holly! ), sometimes it is fun to explore in place where we’ll one day be. South Lyon is one of those places. After a nice long drive from 8 Mile and Woodward to the county’s furthest SW corner (8 Mile and Dixboro), I decided to see what fun I could find in South Lyon. Looking for a place to eat and write, the Lafayette Corner Café seemed an obvious choice (after figuring out that Witch’s Hat Brewery did not serve food). Lafayette Corner Café is located at Lafayette and Lake Streets. Lafayette is also Pontiac Trail and Lake Street is also 10 Mile. They just have special names when you get to the adorable Downtown area. 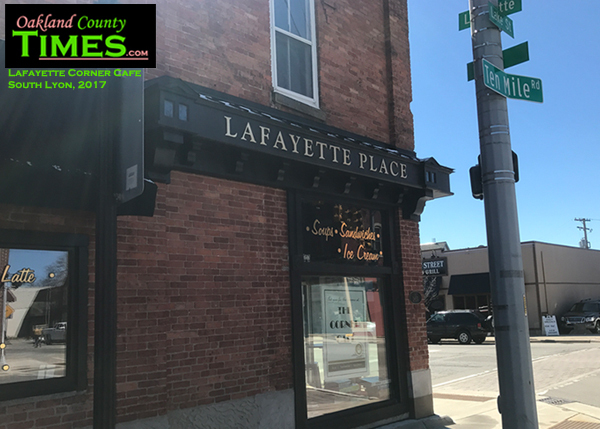 Lafayette Corner Café is at 101 S. Lafayette. 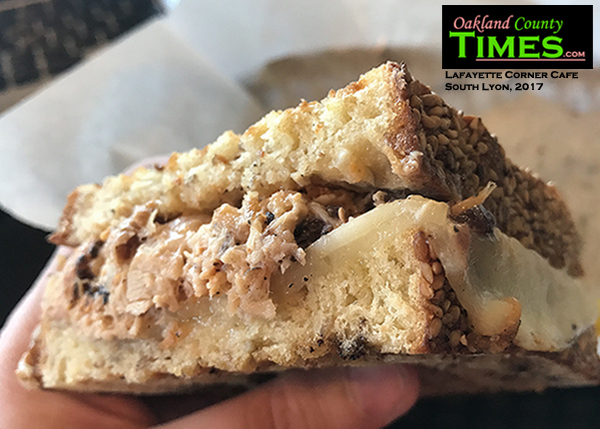 The menu consists of about half a dozen sandwich options along with pastries from Crust in Fenton. There is also fancy coffee and a nice selection of Novus brand whole leaf teas. Tea-wise I selected the Dragon Well Green Tea, mostly because the name was the most magical-sounding of the options. It comes from the area around the Longjing Village in China and is a basic smooth green tea that was very refreshing. Sandwich-wise I went with the Chicken Melt, which was chicken salad topped with provolone and grilled in a Panini press. The chicken salad was flavorful though I could not tell what spices were used to make it so. 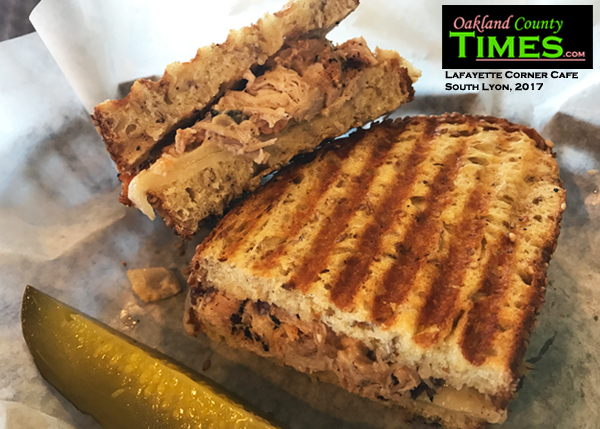 Combined with crispy onion and sweet cranberries and melted cheese with the high quality multigrain bread the sandwich tasted almost addicting. The atmosphere is neat too. The space is shared with Glazy Days, a studio where kids and adults can paint their own ceramics. The back half of the building is for painting and the front is for filling up with your tummy while watching the world go by. Or unintentionally overhearing the small-town gossip from a pair of engaged residents a couple tables over. Fortunately for them, this reporter was only in town for the train station and the tea. But from what I can tell South Lyon is a wonderful place and I look forward to more visits in the future. Lafayette Corner Café seems not to have a website, but you can find them on Facebook. 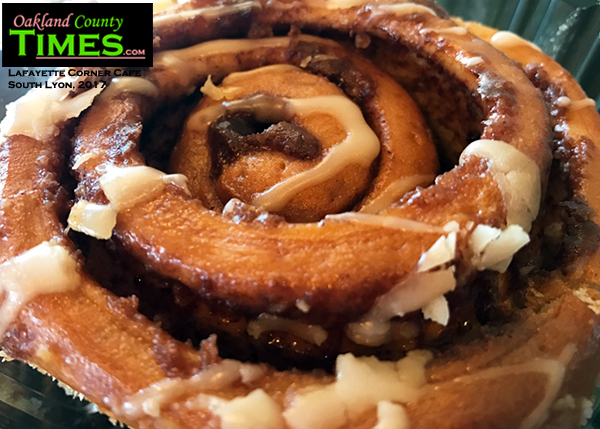 Looking for other delicious places to explore through Oakland County? Check out our Reporter Food Section.